A product’s packaging influences how a customer feels about what’s inside, which in turn affects whether she decides to buy it. Therefore, product developers must be conscious of the perceptions their packaging evokes. Take, for example, this PickFu poll of two different designs for a bamboo cutlery drawer. Option A features an off-white and green color palette, while Option B is predominantly black with gold foil accents. Can you guess which one won? Is packaging that looks luxurious and high-end always a good thing for your product? Not necessarily. This poll demonstrates how a premium appearance can actually work against your product by sending the wrong messages to potential customers. It’s not enough to look nice — the product has to look like it will best fulfill your customer’s needs, which doesn’t always mean looking expensive. Out of the 50 respondents, 28 preferred the Option A, while only 22 preferred the Option B. The trend held true across age groups. In fact, in the 65+ age group, 100% of respondents chose the off-white design over the black design. The only demographic group that did not prefer the off-white design was men, approximately 55% of whom preferred the black design. Women, on the other hand, overwhelming preferred Option A, with only 35% voting for Option B. In the written responses, certain keywords showed up time and again. Those who voted Option A used words like organic, natural, and clean. They also noted that the letters are easy to read on the white background. The respondents who preferred the black packaging used a completely different set of keywords, including contrast, sleek, and high-end. What’s fascinating here is that these responses address how visual designs can invoke values. In every culture, colors and shapes are linked with concepts that may or may not be obviously related. For example, green often feels natural and organic. This makes sense since most plants are green. In contrast, purple is still associated with wealth in much of the world, even though the clear connection has faded over time. The rarity and high cost of purple dye in the ancient world meant that only royalty could afford purple cloth. Nowadays, purple clothes are everywhere and can be worn by anyone. But purple retains a symbolic tie to opulence and wealth, even to people who don’t know how the association originated. Now, back to the situation at hand. Nearly half of the respondents invoke some kind of association between concepts and colors. For example, those who preferred the off-white packaging said that it looked “clean” and that the combination of the white and the green text gave the packaging an “organic” appearance that fits with the theme of bamboo. One particular respondent said that the off-white packaging looked “more economical” when compared to the black packaging. In short, the off-white packaging had a lot of associations that fit into people’s ideal kitchen. What did these respondents have to say about the other packaging? Mostly, they pointed out that the green writing on the black background was difficult to read. At the same time, the respondents who preferred the black design said that it was “sleek” and looked more premium than the other option. Many of them also cited the contrast between the black and the green as a key reason that the design appealed to them. It’s simple — keep color associations in mind when designing packaging and advertising for your product. For one customer, having a sleek, black design that feels luxurious might be attractive. A different customer might prefer a natural and organic feel to the design, especially if it signals that the product is more economical. It all depends on the type of customers you’re targeting. The best way to understand how customers perceive your design choices is to ask them. 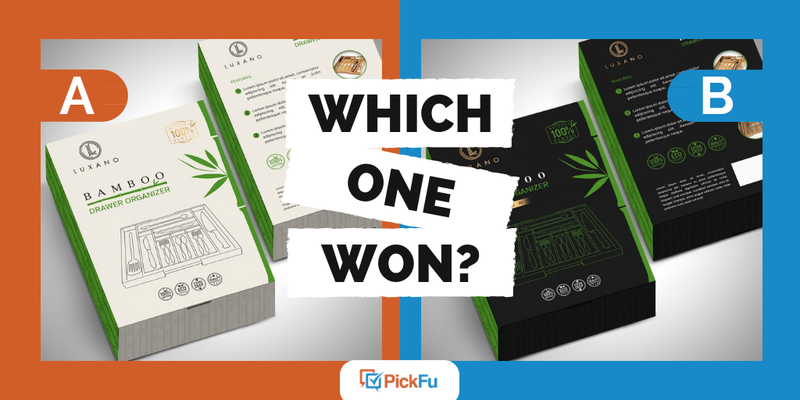 Browse other product design polls, then try PickFu for yourself today! Originally published at The PickFu Blog.